The BVSF have negotiated reduced training costs with Salvage Wire in relation to the safe handling of Electric Vehicles and the first training session has now been completed. Hybrids and electric vehicles are now getting to an age where they don’t only come through as salvage but also as end of life vehicles. There are plenty of risks involved with handling these vehicles for the unwary and a new training course from Salvage Wire will put you on the right track. You may not have taken much notice of these vehicles yet but be warned, they will soon be coming thick and fast with many variations from many manufacturers. Toyota have now sold over 6 million hybrids worldwide. If we look at the future, the prediction for worldwide car sales in 2020 is 85 million, with over 40% of those having some form of hybrid or electric capacity. This market has to be taken seriously. The days of recognising these vehicles as being obviously hybrid or electric are coming to an end as manufacturers are now offering these variants within their normal product range. The current Golf for example is available with diesel and petrol variants, and hybrid and full electric versions will be in production in the next 12 months as well. In the future you will have to check each model carefully prior to any work commencing just to be sure of its power source. 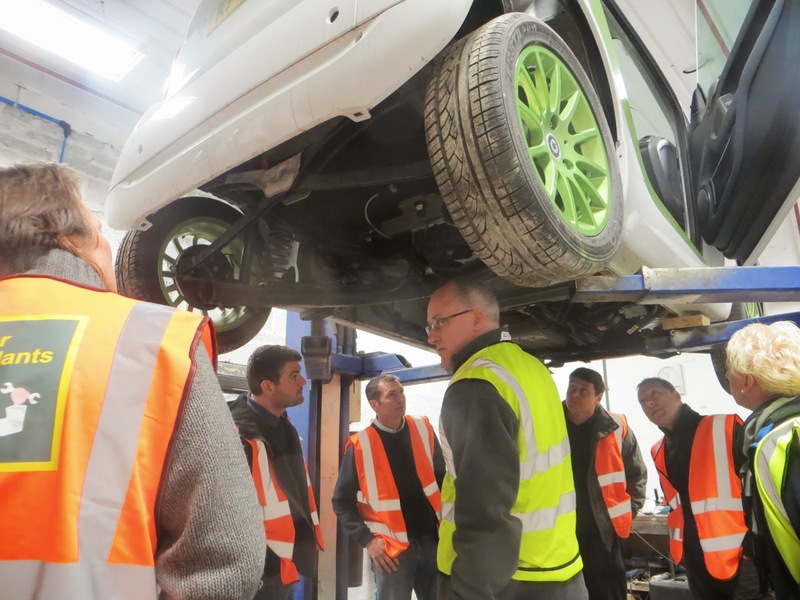 Salvage Wire’s training day didn’t focus on what parts are saleable and how much return you may get for them, rather it gave attendees the knowledge to safely process these vehicles. With the potential of 500 volts+ in some systems, then understanding the beast is essential or you could very easily be looking at a fatal injury. Making sure your staff know how to process these vehicles is essential. The day covered both hybrids and electric vehicles and included both classroom and practical sessions. A test was taken at the end of the day and certificates issued to those passing. For the dismantler, the big issue with all these vehicles is making sure that they are safe to work on. They all have methods of isolating the power from the components but all systems are different and so are the methodologies. The day looked at the various options available. For example, did you know that there were parallel hybrids and series hybrids, not to mention range extenders or full electric vehicles. Developments are coming thick and fast. Mazda’s i-Eloop system is an example of something different again, where a regenerative braking system is used to run the electrical functions of the vehicle (gives up to 10% increase in fuel consumption). The reality is that the different designs that manufacturers use makes it a bit like skinning a cat - there’s plenty of ways to do it! Andy covered the issues that the dismantler may come across, and how to tackle them. What to do if you have a leaking battery (these are a lot different from your normal car battery), how to store batteries, inspecting and isolating vehicles that have damage limiting access, the high risks caused by the strength of the magnets within the generator/motor units. All these can have serious implications if not treated correctly. The equipment you need to handle these vehicles is not that specialised but you do need to be aware of it. We have already mentioned the risks of electrocution but the operator must be aware of the potential dangers from the battery electrolyte. The other big danger we touched on is the power of the magnets. There have been incidents where the strength of these have pulled the generator / motor assembly against metal so hard that fingers have been severed - be warned! Those attending agreed that they had a much greater understanding of these vehicles after the course and felt confident that they could dismantle one in a safe and efficient manner. The trick is to firstly understand the systems so you know in your mind how the vehicle functions. That then must be followed up with the specialist information for a particular model. A prime source for this is the Idis2 system that includes the correct dismantling information for all vehicles sold in Europe. This is a free system for dismantlers and covers not only hybrid / electric vehicle details but all makes and models. If you are not already registered, then visit the idis2 website. If you are a BVSF member and would like to book a hybrid/EV course then please contact the BVSF in the usual way. For an introduction to Salvage Wire.